MINNEAPOLIS — The Minnesota police officer who was acquitted in last year's fatal shooting of black motorist Philando Castile will receive $48,500 as he leaves the suburban department that employed him at the time of the killing, according to a separation agreement announced Monday. 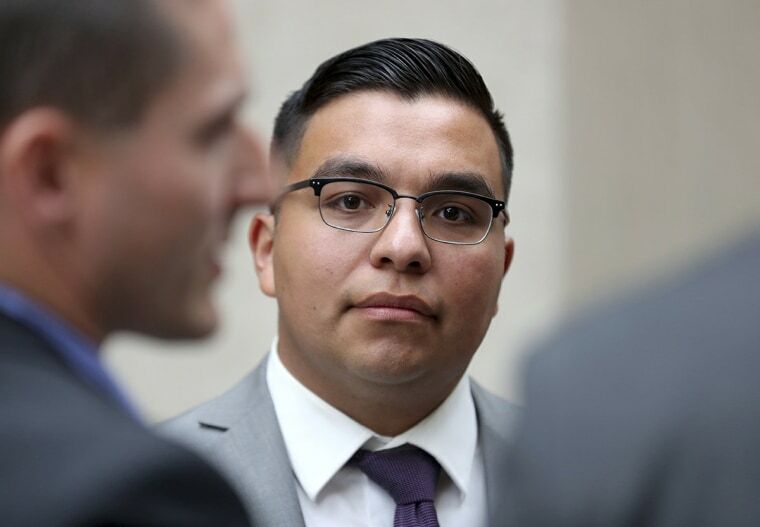 Jeronimo Yanez will be paid the money in a lump sum, minus applicable deductions and withholdings for state and federal taxes. Under the five-page agreement released to The Associated Press through a public records request, the Minneapolis suburb of St. Anthony also will pay Yanez for up to 600 hours of accrued and unused personal leave pay. The agreement, which has Monday's date, doesn't say how much time he has accrued. Castile, a 32-year-old elementary school cafeteria worker, was shot by Yanez during a traffic stop on July 6, 2016, after Castile told the officer he was armed. Castile had a permit for his gun. The shooting gained widespread attention after Castile's girlfriend, who was in the car along with her then-4-year-old daughter, livestreamed its gruesome aftermath on Facebook. Yanez, who is 29 and Latino, was acquitted of manslaughter and other charges in June. On the day of the verdict, the city announced the "public will be best served" if Yanez were no longer an officer. The city said Monday that the agreement "ends all employment rights" for Yanez. "Since Officer Yanez was not convicted of a crime, as a public employee, he would have appeal and grievance rights if terminated," it said in a statement. "A reasonable voluntary separation agreement brings to a close one part of this horrible tragedy. The City concluded this was the most thoughtful way to move forward and help the community-wide healing process proceed." Under the agreement, the city is released from lawsuits by Yanez. He was given 10 days to consider and sign the agreement and has 15 days to rescind it in writing. The agreement noted the official "date of separation" as June 30. Yanez wrote his initials and Monday's date on each page of the agreement and signed the last page along with the city manager. Castile's uncle, Clarence Castile, said he's glad Yanez will no longer be an officer. "He should be in jail," the uncle said. "He's like a fish that wiggled his way off a hook. ... Hopefully he won't be able to get a police job in the United States. Because he's a poor example of a police officer." Yanez had been with the St. Anthony Police Department since November 2011. His annual salary at the time of the shooting was more than $72,600, not including overtime pay, according to documents released by the city. His acquittal led to days of protests, including one in St. Paul that shut down Interstate 94 for hours and ended with 18 arrests. At a recent city council meeting, residents of St. Anthony called on the city's mayor to resign. After the trial, Castile's mother, Valerie Castile, reached a nearly $3 million settlement with the city, precluding a wrongful death lawsuit. The Associated Press examined several high-profile fatal police shootings and found severance or separation agreements for officers to be unusual. In some cases, officers were fired outright. In many cases where charges were not brought or officers were acquitted, they have remained on the job. In the August 2014 shooting of 18-year-old Michael Brown, who was unarmed and black, Ferguson, Missouri, police officer Darren Wilson did not receive a severance package when he resigned. Wilson was not charged in Brown's death, which led to months of sometimes violent protests and became a catalyst for the national Black Lives Matter movement. At the time of Wilson's resignation in November 2014, the St. Louis suburb said it had cut ties with Wilson and he would not receive any additional pay or benefits. Wilson's attorney said he chose to resign after threats were made against the police department. Chicago officer Dante Servin resigned last year just days before a hearing to determine if he should be fired for the 2012 shooting of Rekia Boyd, an unarmed 22-year-old black woman. Servin, who was acquitted of involuntary manslaughter, has since asked for disability pay for post-traumatic stress disorder. A decision on whether he qualifies for that pay, which could amount to tens of thousands of dollars, is pending. David Larson, an employment law professor at Mitchell-Hamline School of Law in St. Paul, said reaching a voluntary separation agreement can be simpler than firing a public employee like Yanez. Most collective bargaining agreements require several steps before someone can be dismissed. And if a dismissal is contested, there can be a lengthy grievance and arbitration process. "Given the emotion that's been involved with this and the public protests, St. Anthony is probably saying the most important thing to us is to wrap this up as quickly as we can," Larson said.